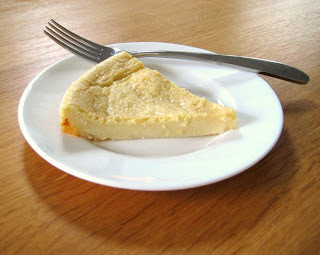 You know sometimes you come across a recipe and think 'nope that can't possibly work', well that is exactly what I thought when I stumbled across this recipe for an all-in-one pie and crust. I was intrigued though; making and rolling out pastry isn't exactly easy with arthritis. Blind baking and then filling a tart case without redecorating the kitchen floor with the filling is near impossible. So in the interests of everyone wanting to make a tart or pie with arthritis everywhere, I gave it a go - and, you know what, it really does work. Don't expect a crumbly, biscuity type crust - it makes a much more tender, delicate crust but its still very tasty. Pour all the ingredients into a blender and whizz or use a stick blender or whisk. Pour into a well-greased 8inch cake or pie pan. Pop in oven and bake for about 30 minutes or until centre is just set.Allow to cool for 10 minutes and then serve. You could make this gluten free my substituting the wheat flour for a good gluten-free blend. The custard tart goes very nicely with fresh raspberries to help you get an extra portion of fruit. The tart is reasonable source of calcium thanks to the milk - if you need to gain weight try using whole milk or even jersey milk.